Plus 5 More BONUS Resources You Will Love! Get-A-Clue Devotions by Mark R. Littleton. The Case of the Howling Dog and 51 More Mysteries by Mark Littleton (For ages 8-12). Finding devotional resources that will keep the attention of older elementary and middle school students can be a challenge. This book has 51 mysteries, and each one is divided into 7 days of readings. Families will enjoy reading the stories together, guessing what will happen next, and discussing the morals and questions. Example Mysteries: Blue Flash, Dark Passage, Golden Horse, Wandering Bear. BONUS Check out Gabbit smartphone App. Jesus Calling: 365 Devotions for Kids by Sarah Young. We love this devotion book. 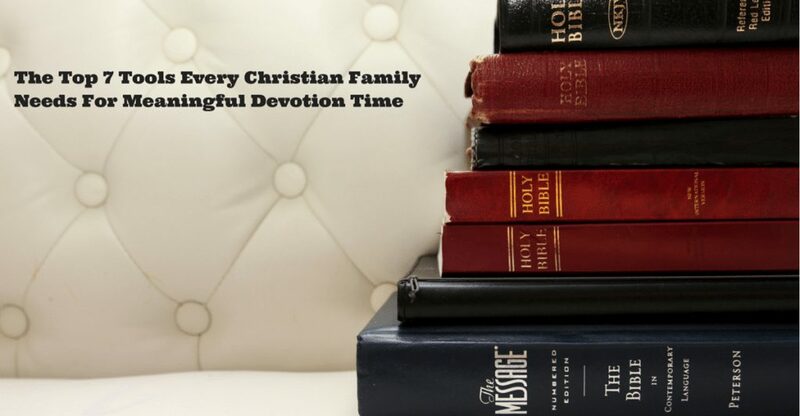 Based upon the adult version of the same book, these devotions are written as if God is speaking right to you, and each of us in our family finds that the daily reading speaks right to our hearts with a relevant message for our daily walk with God. At one page each, if you had to choose just one resource for the whole family, this is one we have come back to again and again. Playtime Devotions: Sharing Bible Moments with Your Baby or Toddler written by Christine Harder Tangvald, illustrated by Tamara Schmitz. We absolutely adore this resource created for the littlest ones! These short devotions are each just one page long and include a poem or rhyme, songs, and a prayer together. A dear friend of ours gave us this as a gift when our son Josiah was in Parents and 2s Sunday School and we used it for many years when our children were toddlers. Thanks for reading our list of resources. 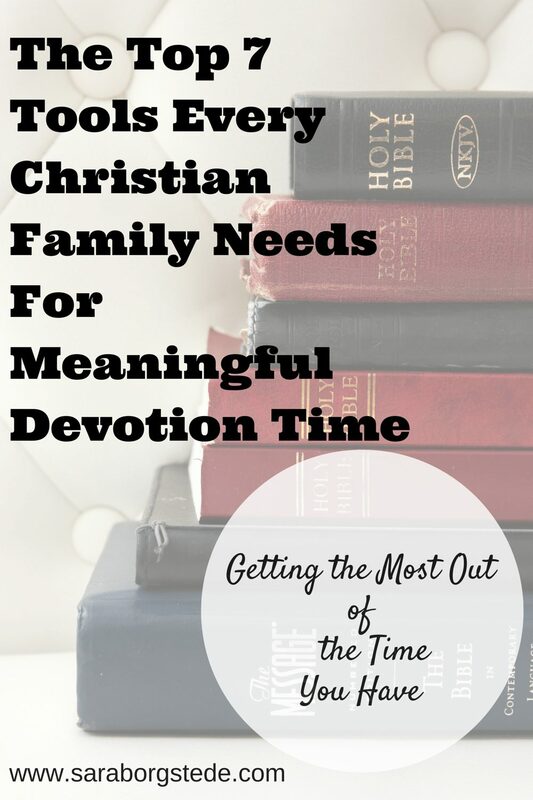 I hope these are helpful to your family for meaningful family devotion time. I know it’s not always easy to carve this time into a busy schedule, but it’s so worth it. Check out my Facebook and Pinterest pages for ongoing encouragement. What tools or ideas has your family found helpful? Contact me at sara@saraborgstede.com to share your ideas! Blessings as your family grows together in faith!